If left to their own devices, your users aren't likely to do any better than Gomer Pyle-- unless they happen to be experts in library science and information mapping. Categorization is extraordinarily difficult to do correctly unless you're an expert in the field. And even then, there is disagreement. I was drunk on the power of elastic search. If you have used elastic search at all then you will know what I mean. Having the power of full text search at your disposal things like tagging start to look trivial. If you need to find something just use search... or so I thought. While we as humans can make out the meaning of the word game from the context it has been used it. Elastic search can not. Thus the search for game would return everything that has the word game in it. Which might not be what the user actually wanted. Hence I decided to add tags to specter and after some slight changes to the editor and the underlying code it is now possible to tag your posts. This process is straight forward. 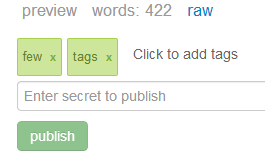 In the preview pane of your editor just type the tags the you want for your post. If you want to delete tags just press backspace or hit the x button on top of the tag. That's it. Clicking on a tag in the post will take you to a list of posts in that category. Just as you would expect. I hope you guys find this feature useful. A big thanks to xoxco for creating the awesome tags-input plugin.